We believe it is necessary to establish an environment where the elderly, the young generation, child-rearing couples, and likewise, residents with disabilities are able to collaborate with and support each other in embarking on small business projects. 団地の空き店舗を利用して、地域の人材が、高齢者・子育て世代や障害者を支援するようなコミュニティビジネスをつくりたい。1. Use vacant shops in the housing complex to set up community businesses among the elderly, young generation and people with disabilities. 団地スクールをつくり、自分たちの経験・知識・特技を、地域の子供たちへ伝えたい。2. Establish a school in the complex premises where the residents can share their experiences, knowledge and abilities to the children. 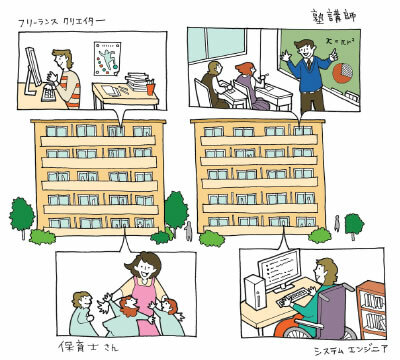 地域の大学と連携し、新しいサービスやモノづくりをしたい。Cooperate with the university in the area to offer new services and creative products. Copyright © Archi-Mall Co., Ltd. All Rights Reserved.